How I Got this Book: Birthday present. Why I Read It: A dear friend of mine, who recommended Austenland to me, told me that if I loved Austenland, I'd love this one. Have you ever read a book that was cute and well written, but left you feeling “meh”? That’s kind of what happened to me with this book. Now, many of you know how much I loved Austenland, by Shannon Hale. It was actually my first review here at The Broke and the Bookish! 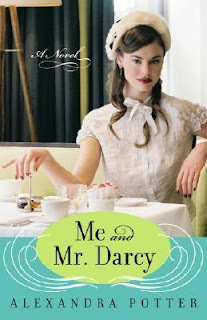 You should go check it out, especially since the companion novel, Midnight in Austenland, is coming out in January! I’m so excited! Anyway, on to this book. I was looking for something along the same lines as Austenland. As per the recommendation of a friend, as well as a few Goodreads reviews, I figured I’d give it a shot! “Dreams come true in this hilarious, feel-good fairy tale about life, love, and dating literature’s most eligible bachelor! After a string of disastrous dates, Emily Albright decides she’s had it with modern-day love and would much rather curl up with Pride and Prejudice and spend her time with Mr. Darcy, the dashing, honorable, and passionate hero of Jane Austen’s classic. So when her best friend suggests a wild week of margaritas and men in Mexico with the girls, Emily abruptly flees to England on a guided tour of Jane Austen country instead. Far from inspiring romance, the company aboard the bus consists of a gaggle of little old ladies and one single man, Spike Hargreaves, a foul-tempered journalist writing an article on why the fictional Mr. Darcy has earned the title of Man Most Women Would Love to Date. Ok, so the writer of that back-of-the-book summary did an amazing job, and I really can’t come up with anything else to say about the plot. It was a slow, basic, fluffy plot that was perfect for a leisurely day of summer reading. It was very easy to follow Emily and her gaggle of old lady friends through their little bouts of drama as they toured the English countryside. Some of these women were cute and hilarious, and some of them bugged me. They formed a pretty strong bond with Emily in the short amount of time they had, though, so I got to really like them at about the same pace that Emily did. They were always concerned about her, and kind of took her under their wing as she discovered things about herself. Mr. Darcy does make an appearance in the book a few times, but it was weird. I’m not sure if it was a cut in the fabric of time, Emily’s mindless daydreams, or visions from a higher power, but the two of them had innocent encounters throughout the course of the book. Nobody saw him but Emily, so she was viewed as being a bit crazy whenever she mentioned seeing him. Mr. Darcy bugged me. He was weird, and came off as selfish and cocky. I think that’s why this book left me feeling “meh”. I love Mr. Darcy, and I think the author of this book decided that people like Mr. Darcy too much. I don’t have skewed views about men because of Mr. Darcy, but I do appreciate him and enjoy thinking about finding someone similar (thank you, BBC). I left this book not liking Mr. Darcy, and I was not happy about that. The writing was done well, and the story idea was cute. I was just not extremely fond of the execution or the characterization. It’s taken me quite a few days to review this book, just because I’m not used to being so lost for words. I have reviewer’s block. Does this ever happen to anyone? Do any of you read a book that leaves you ready to be finished with it, and ready to move on to something else? Do you only review books you love or hate, and leave the “meh” books to be reviewed by someone else? I hate the feeling when you close a book that was just...okay. I prefer to be blown away, but not every book can do that. I am going to add Austenland to my TBR, and maybe this one, just because I get a kick out of Jane Austen-themed novels, and they both seem like they would be fun to read. I felt the same meh about this book. I have this book to read my mum's friend lent it to me I hope I like it a bit more than meh. I know what you mean. In some ways it's worse when a book isn't *quite* bad enough to abandon halfway. Molli and Sara, do it! Read Austenland! Rachel, you are so right!! I'd never thought of that. As the Crowe... - I should look into that! Thanks for the recommendation! Oohh Mr Darcy ! I prefer Tilney but why not ? ?